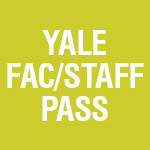 Yale Faculty & Staff Passes are available online for current Yale faculty and staff only and require a valid Net ID. You may purchase two passes per Yale ID and may be asked to show proof of eligibility to enter the performance. This pass valid from August 13, 2018 through May 18, 2019.